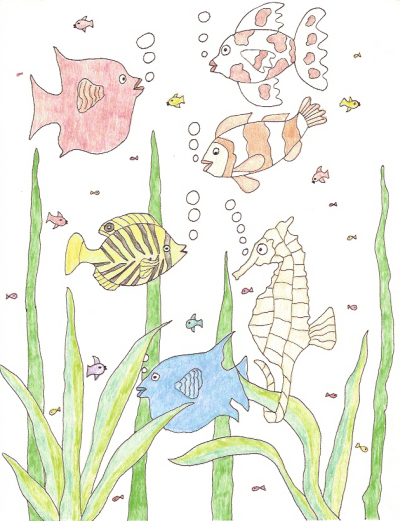 All of the fish under the sea had bright colors, swishy tails and fins and could blow big bubbles. Some had stripes, others had patches and some were brilliant and shiny. Sam, a seahorse, didn't fit in with the rest of the fish. He had a fin and he could blow bubbles, but he didn't have bright colors, stripes, patches or swishy tail. While most of the fish swam around, Sam wrapped his tail around a piece of sea grass and floated in one spot. Sam ignored the other fish, though he was lonely and wished he had a friend. One day Same smiled. As the other fish swam by they wondered why Sam was so happy. The fish swam all around Sam in a circle watching him. From then on the fish came to play with the babies and visit Sam. Some of them offered to take care of the little ones so Sam could go for a swim and get something to eat. Never again did Sam feel lonely and not only did he have a lot of babies, but he now had a lot of fish friends.